Photos by Charlie Frick, Motorcar Studios and ABRR photographers. On a quiet cul-de-sac in the sleepy hollow of Quakertown, a â€œBritish Invasionâ€� was about to disturb the bucolic neighborhood. Thirty-two â€œTeamsâ€� were descending on the area on a beautiful, sunny, and brisk October Friday morning. 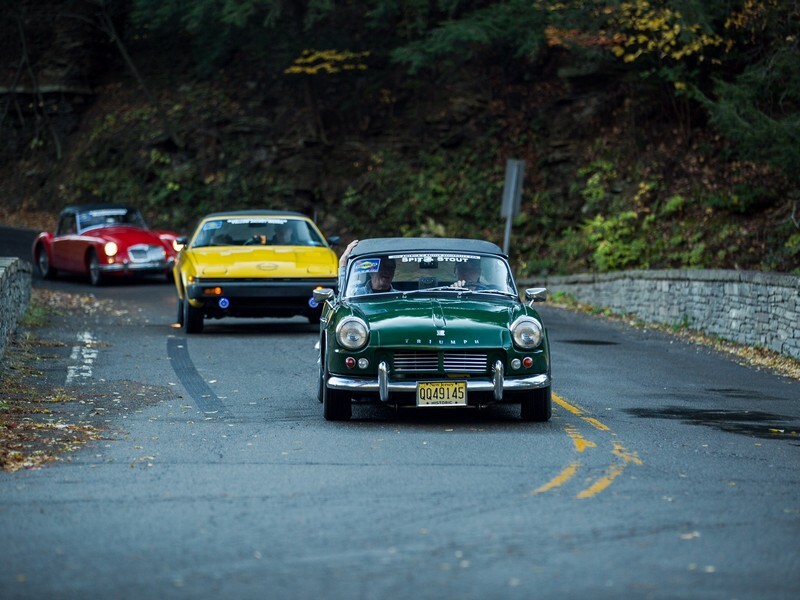 This was the start of the 2015 Americaâ€™s British Reliability Run. In reality, the east coast ABRR all started back in 2007 VTR when then DVT Director, DVTDave had a beer with then VTR President, Blake Discher. Back in 2000, Blake and Pat Barber from Detroit Triumph Sports Car Club had run a British Reliability Run in the UK (2000 miles not sleeping in 48 hours!). They came home ready to put together a U.S. based run. 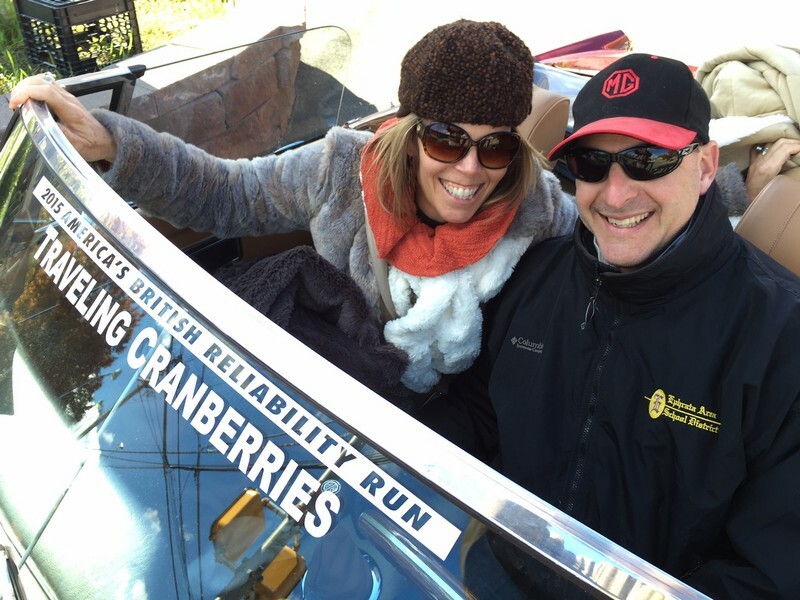 With John Macartney's UK support, the first stateside â€œABRRâ€� was born here in 2002. 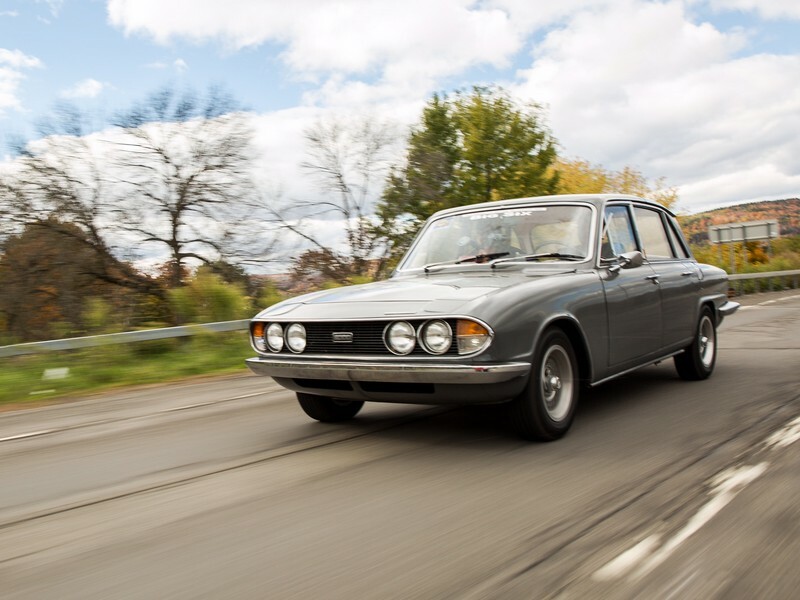 The Detroit-based ABRRs ran 700-800 miles in 48 hours which was a lot easier, but still challenging in 50-year old cars. 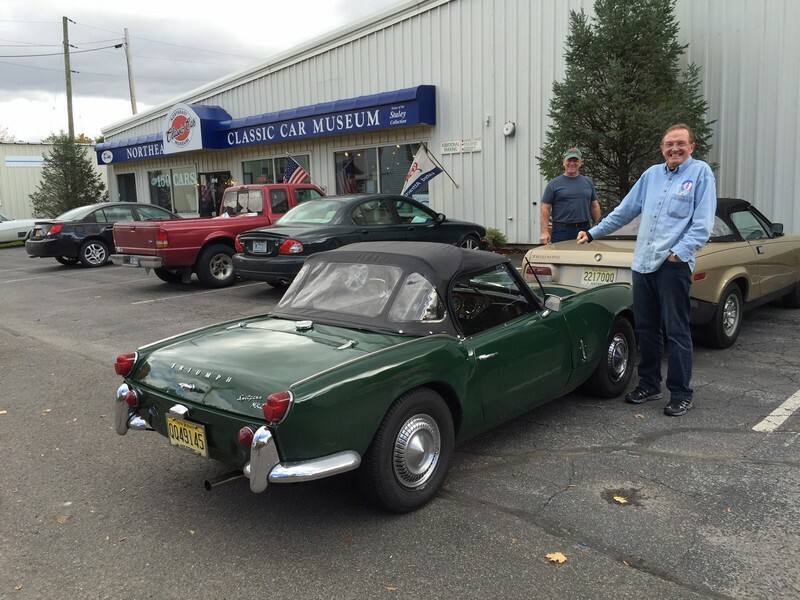 After several very successful ABBRs the run was â€œcopiedâ€� by the Delaware Valley Triumph Club in 2008 and a club in Alabama joined in too! On the same weekend in October 2008, all three clubs each ran an ABRR to support different local children's charities on the same weekend. After several years the Detroit and the Alabama clubs dropped out. leaving the DVT to carry the torch by running an ABRR every other year. Remember it's all about the kids. Now five ABRRs later, we have had the good fortune to have our most successful run yet! 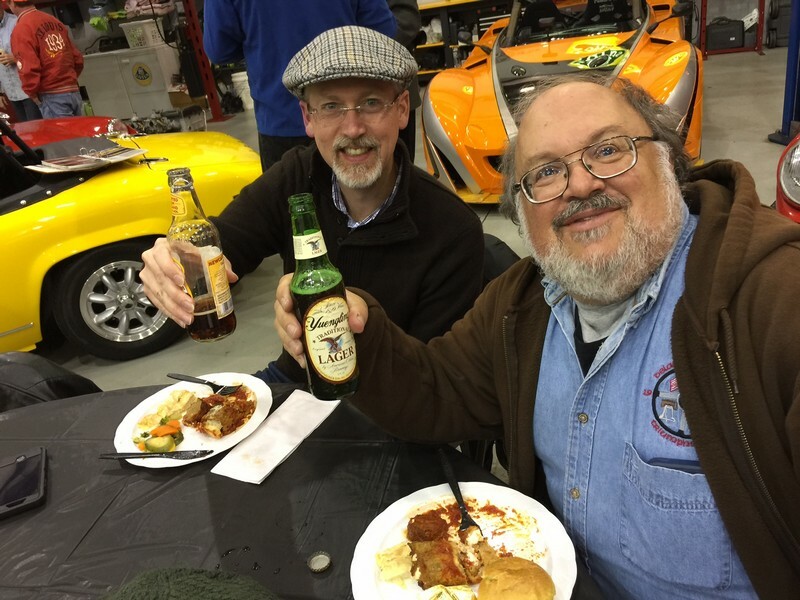 The planning for 2015 ABRR started about nine months ago, again over a beer, at the appropriately-named â€œTriumph Breweryâ€� in New Hope, PA. 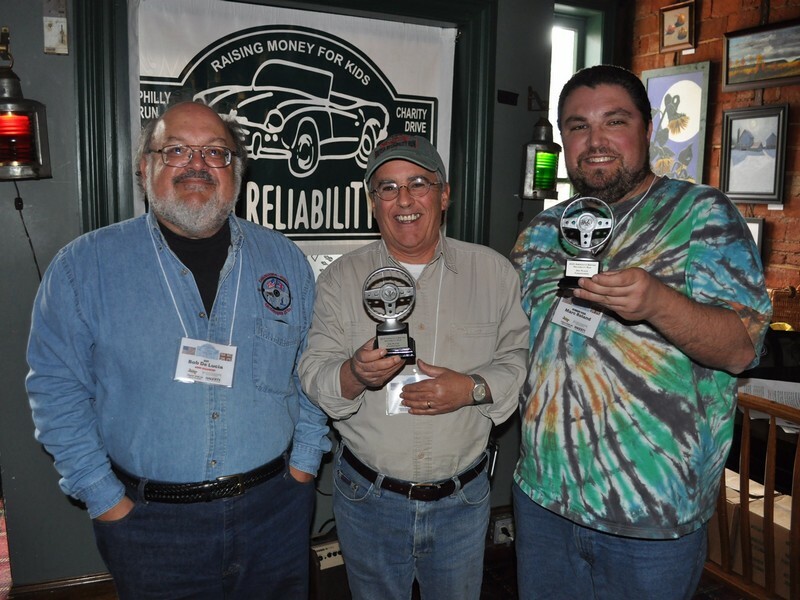 Participating at that meeting were members from the Delaware Valley Triumphs (Bob De Lucia, Dave & Charlene Hutchison, Bruce Schechter, Dan Tinsman), and the Positive Earth Drivers Club (Bob Canfield, Russ Sharples, Wayne Simpson). We all decided to change the format so that the Teams all ended up together on Sunday. Several planning meetings, way too many emails, and several trial runs later, we were ready to go. A very special thanks to Dan and Sherry Tinsman, who planned the spectacular route and test-drove the entire route in mid-August. Dan also created our very-detailed map books. Bob Canfield worked with the NY museum, and restaurant. Dave & Charlene Hutchison worked with the two hotels, the Lotus Shack visit, the breakfasts, the St. Christopher's Foundation, the Entrant Packets and vendor support. Russ Sharples developed our very attractive ABRR web site, as well as updating donations as they were reported. Bob DeLucia planned our meetings, handled registration and all the money. And of course thanks to Ragtops & Roadsters, and Dave & Charlene who had the unenviable and challenging task of driving the support van/trailer to keep up with the cars on the Run. Back to the Run... Friday morning started with a fantastic brunch, panoramic photo and sendoff at 11 AM sharp. The run started in â€œstagesâ€�, with groups of five or six heading north on the country roads towards the Glen every six minutes. These groups during the three days merged, and un-merged as we made petrol/rest stops throughout the weekend. The route as previously mentioned was utterly fantastic, many twisty turns, on the back roads north to our overnight stop in Watkins Glen. 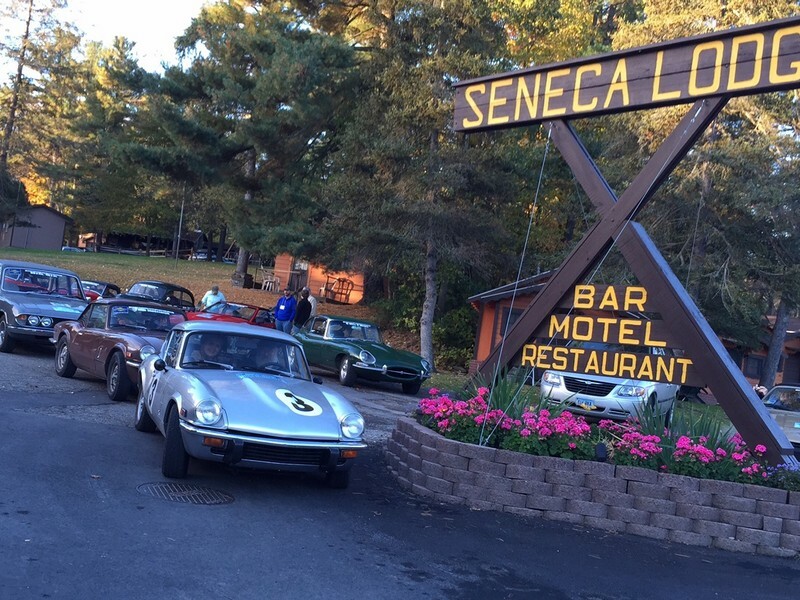 Adding to the vintage motoring ambiance, we stayed at the historic â€œSeneca Lodgeâ€� www.senecalodge.com. 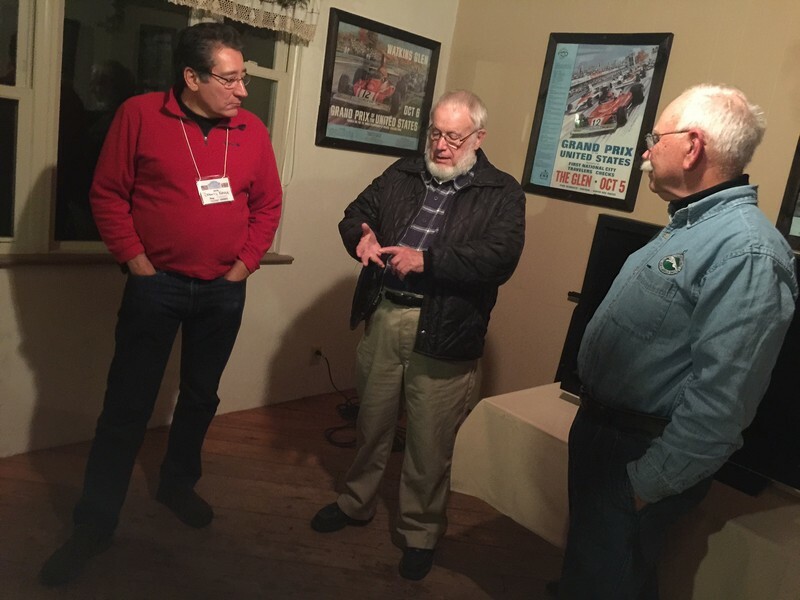 Bill Green, THE Watkins Glen historian, gave a video presentation and answered questions after dinner at Seneca Lodge. Between the motoring history of the lodge, located adjacent to the old street circuit, and the racing memorabilia inside at the bar, and the many classic cars in the parking lot, it was smiles all around! 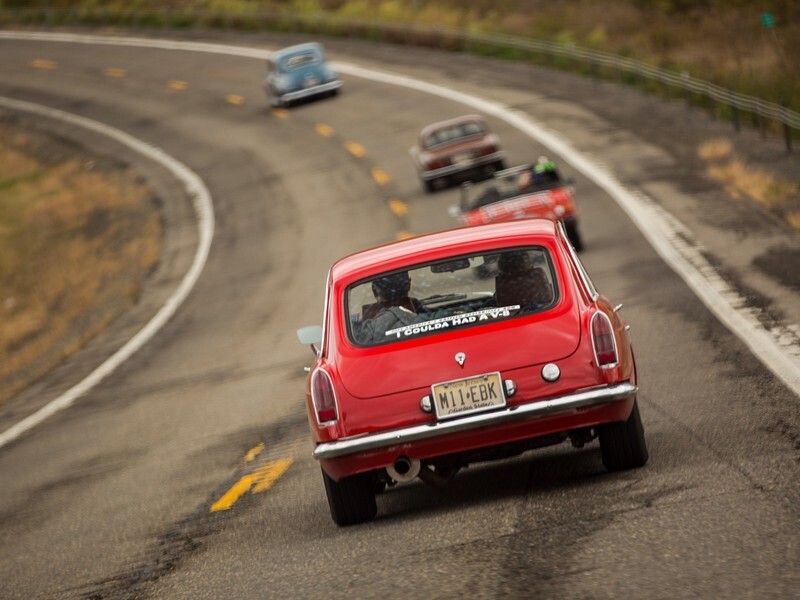 As the mist broke on Saturday morning we added to the nostalgia by starting out with two ceremonial â€œlapsâ€� around the old Watkins Glen street racing circuit. Team â€œMotorcars Studiosâ€� caught all of us at â€œStone Bridgeâ€� on the old circuit. They ran hard all weekend as to get every angle (sometimes hanging out of the car!) Their images and video truly captured the motion and feeling of the ABRR! After a â€œsplash and goâ€� at Franklin St. Sunoco stop, we traveled further north on Rt 14. 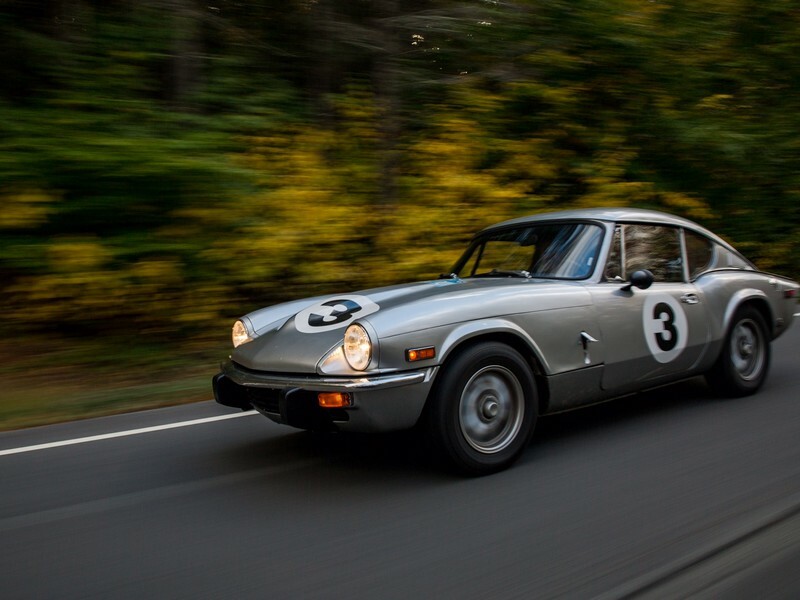 The Ragtops Support Crew did serve its purpose, as one TR6 s had some electrical issues pulling out of Watkins Glen on Saturday morning as the â€œPrince of Darknessâ€� reared his ugly head to create â€œignition failureâ€�. 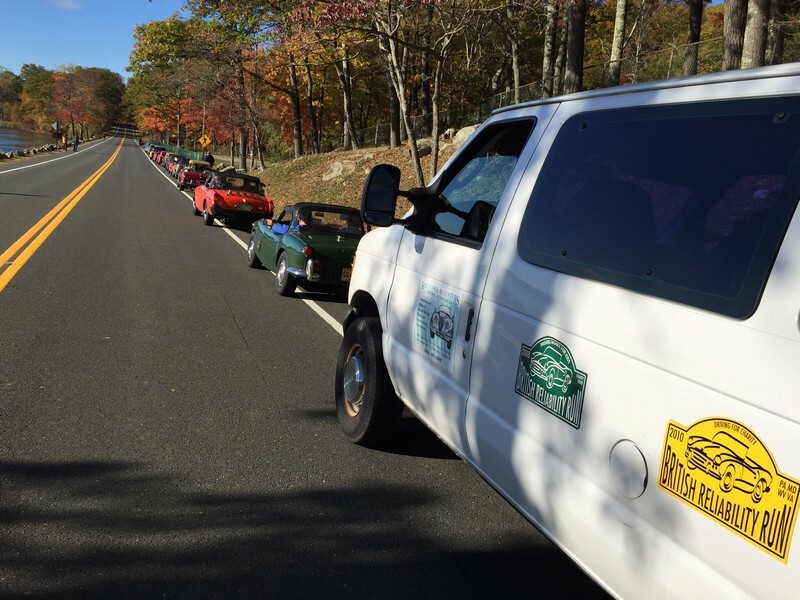 In an effort to save time and keep up with the Run, Dave's 02 Miata the â€œThe Car of Shameâ€� was deployed from in the trailer and swapped for the TR6. When we reached dinner stop at the Lotus Shack on Saturday night the TR was quickly and professionally repaired, and on the road again that evening. After the TR6 swap we traveled past at least a dozen wineries to the top of Lake Seneca, and eventually south east through Ithaca to Norwich, NY. At Norwich we visited a gem of a car museum to stop at for lunch in the middle of nowhere. Over 150 cars of all marques. The Northeast Classic Car Museum, http://classiccarmuseum.org/ visit if you can. 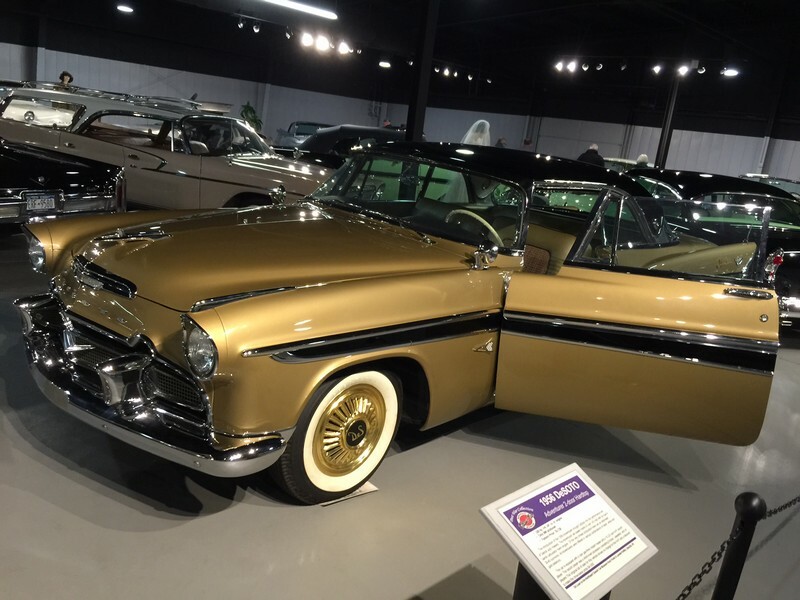 I was very pleased to find a 1956 Desoto Adventurer that came through our sister shop, Pollock Auto Restoration in the museum. After a nice lunch we were back on the run now heading through the winding roads of the Catskills Mountains further southeast to Chester, NY. 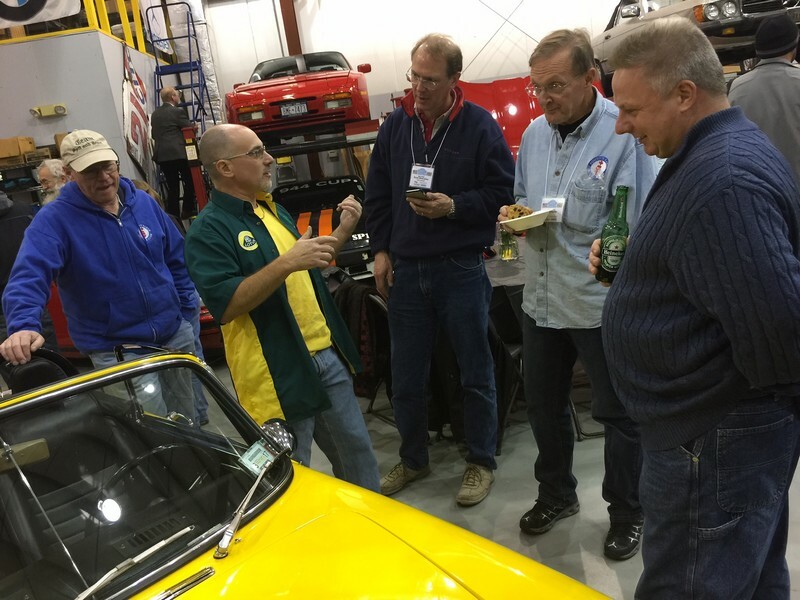 Our dinner stop was hosted at the owners of â€œThe Lotus Shackâ€� a private collection of a dozen classic Lotus sports cars and exotic cars. We were invited by the host to get in and try the cars on for size! We were also treated to plenty of beer, wine, soft drinks and delicious buffet of appetizers, and a fantastic dinner with dessert! Thanks guys! It was great! Sunday morning again brought bright skies and we headed south towards NJ. But first we were treated by our hosts of the Lotus Shack to a wonderful and spirited ride through Harriman State Park. Many commented this was one of the best sports car roads they had ever driven with its tight, twisting narrow roads and hills. Some passengers may describe it as â€œwhite knuckle drivingâ€� but from behind the wheel it was all about why we love our sports cars! We found our way through Sussex County to gather together. Appropriately enough, our finish for ABRR luncheon was the quaint British Pub called the â€œShip Innâ€� in Milford, NJ which we pretty much filled to capacity. Besides the many good pints of Muddy Waters Porter. Best Bitters, ESB, we had a buffet of English staplesâ€¦.Fish and Chips, Scottish eggs, Shepherdâ€™s Pie, Sausage Roll, and Cornish Pastry. In summary the changes we made months ago brought success! Thirty-two â€œTeamsâ€� almost doubled the number of Entrants which as you will read directly affected our donations! Participants came in from North Carolina, Massachusetts and Washington D.C. as they represented many British car clubs: British Motor Club of Southern New Jersey, Capitol Triumph Register, Lanco MG Club, New Jersey Triumph Association, North American Spitfire Squadron, Philly MINI Car Club, Positive Earth Driverâ€™s Club, Triumph Wedge Owners Association. 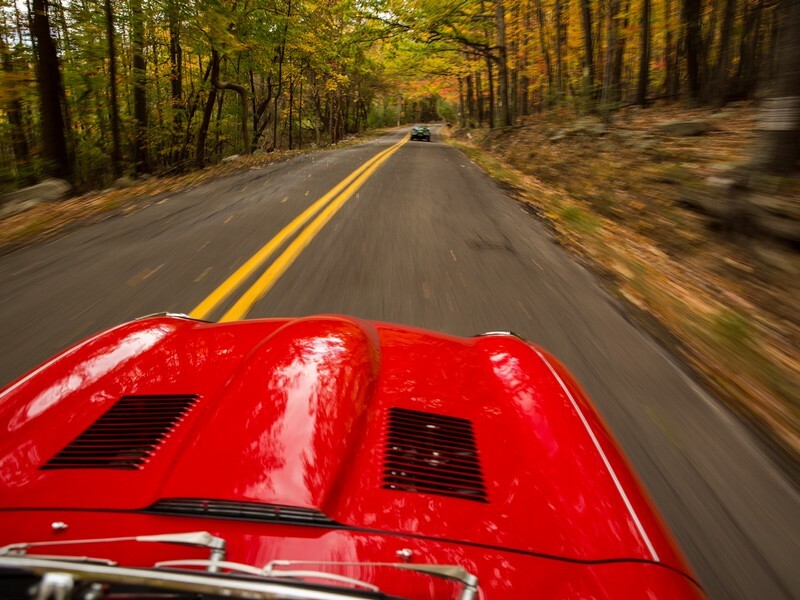 Also we want to thank the Delaware Valley Jaguar Club, Austin Healey Sports and Touring Club, Philadelphia MG Club, TVRCCNA, Vintage Triumph Register and the host club, the Delaware Valley Triumphs all of which donated a total of $2500.00 to the cause! A big thanks go out to these British Car Clubs for their financial support. The DVT showed the strongest support with ten â€œTeamsâ€� competing on the run in 2015. These DVT Teams raised over $9000.00 for the charity, with â€œTeam DVTâ€� finishing 2nd and raising $1,715.00, and â€œTeam Rubber Soulâ€� finishing 3rd and raising $1299.00) and the Ragtops Support Crew raised over $3000.00! 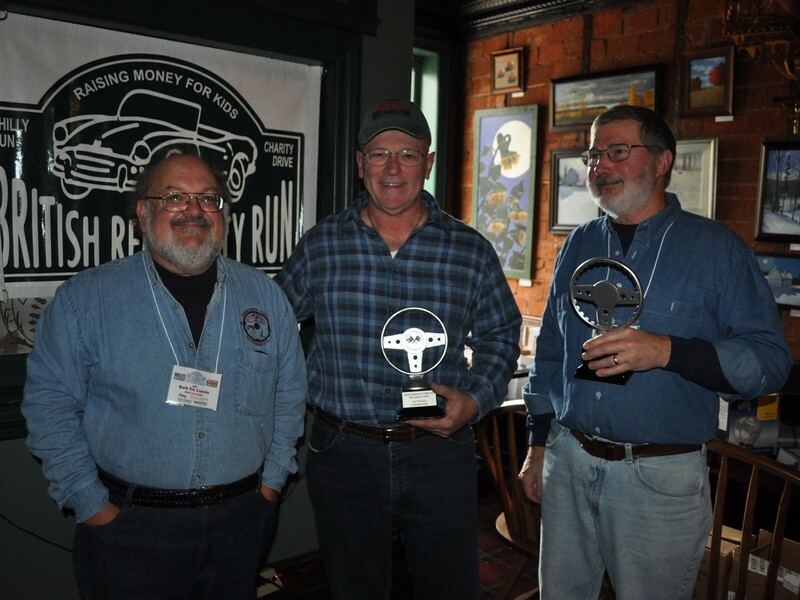 (withdrawn from competition by Dave) The 2015 ABRR First Place was captured by â€œTeam Wedgeâ€� Art Becker and Pete Dow from Positive Earth Drivers Club raised $1685.00! 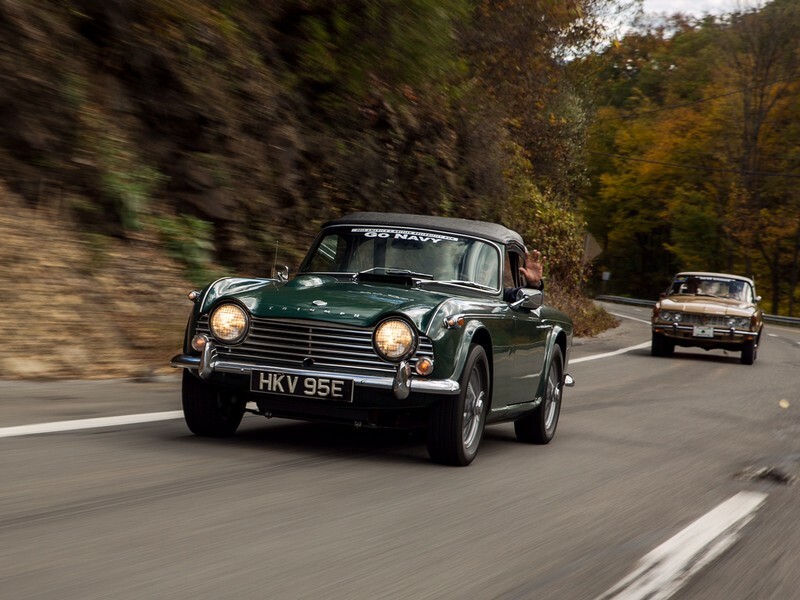 On the run were two TR4â€™s, three TR6â€™s, one TR7, two TR8â€™s, one GT6, one Spitfire, one Vitesse, and one very rare Triumph 2000 MK2. We also had a 1964 Austin-Healey 3000, 1967 and 1968 Jaguar E-Types, a 1960 and 1961 MGA, four MGBâ€™s, a MGB GT, a MGB GT V-8, a MG-Midget, a 1964 Mini, a 1965 Mini-Moke, a 1961 Morris-Minor, the oldest car on the drive, a 1950 Rover 75, a 1969 Rover TC, and two â€œmodernâ€� cars, a 2004 Jaguar X-Type, and a 2013 Mini Cooper S.
The ABRR leaves no-one behind! 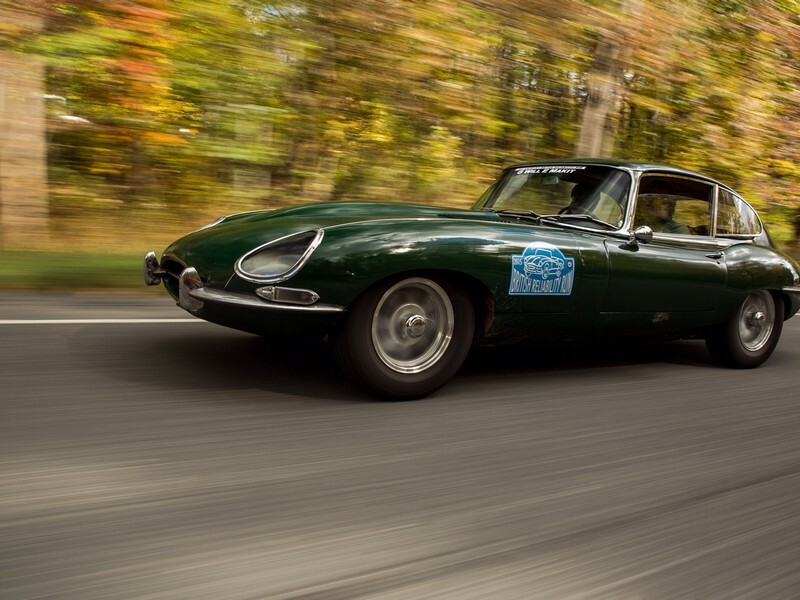 Thirty-two British cars started, and 611 miles later thirty-two British cars finished. We had only a couple of electrical problems, bad suspension bushings, carb linkage adjustment and a bad throttle cable, all of which were repaired on the road. A cumulative total of 19,552 miles driven in three days. As we said it was a â€œBritish Reliability Runâ€œ! End result, the 2015 ABRR raised $23,807. A real team effort! All said and done, 22 Teams raised over $500 each a for new ABRR record. A check will be presented at the start of the â€œBefore We Put emâ€™ Away Runâ€� at Ragtops & Roadsters on Sunday, November 22nd, at 9:30 AM, to Dr. Michael Spear, St. Christopher's Foundation, Palliative Care Unit. 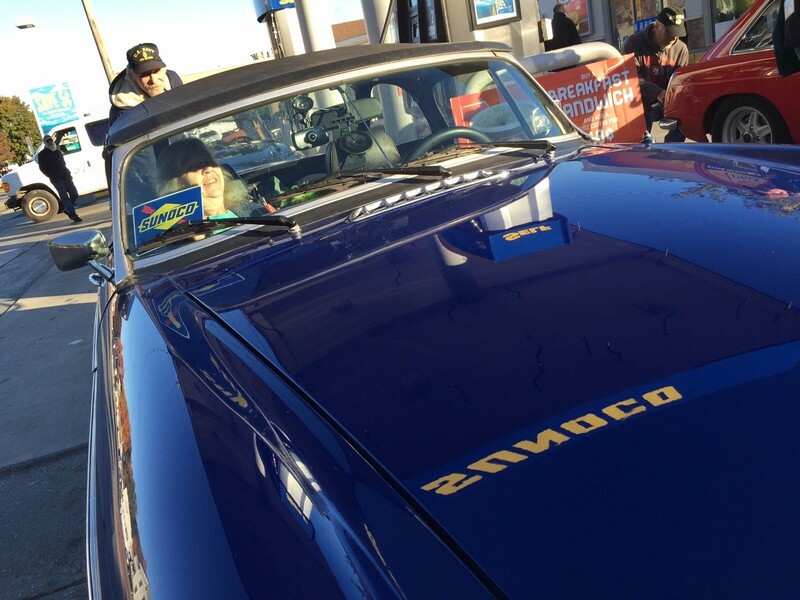 Thanks to our sponsors who made the 2015 ABRR a wonderful success, Sunoco; who powered the Run with gas cards for each Team, Hagerty Insurance who provided roadside assistance packages if needed, Motorcar Garage who provided hats for over 60 entrants, Ragtops & Roadsters who provided the support van and trailer. And everybody else who contributed in support of gifts, Victoria British, Moss Motors, Little British Car Company, The Roadster Factory, Hemmings Sports & Exotic, Morphy Auctions, Cargo Trailers, Whispering Hill Studio, Luxury Brokers International and Motorcar Studios. 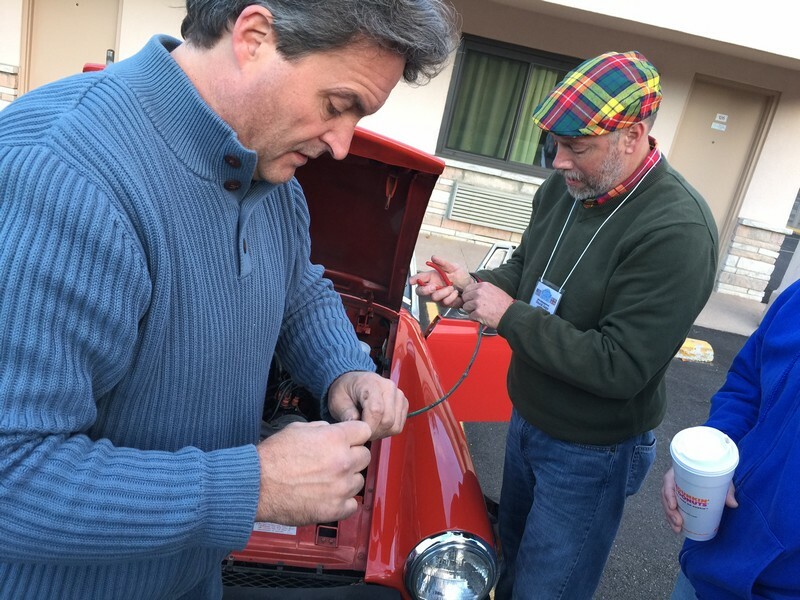 And of course, a big THANK YOU to ALL of the 2015 ABRR Teams for their terrific enthusiasm and dedicated efforts to keep our vintage motorcars on the road and hard work to raise funds to support the new C.O. R.E. Program for St. Christopher. It's all about the KIDS! PS: News Flash: The ABRR Organizers met a just voted earlier this week to Run AGAIN in 2016 on the same weekend! Save the date 10/14-10/16.